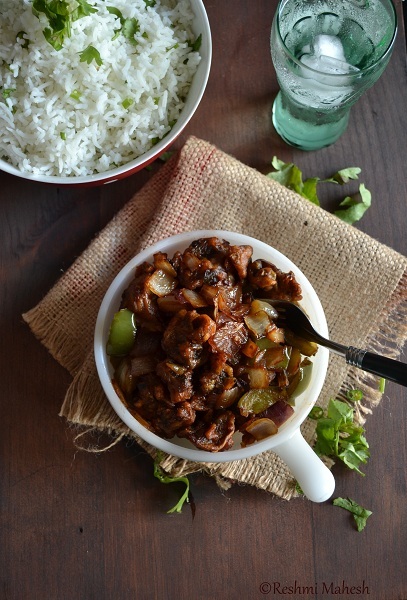 Easy Cook: Mushroom Manchurian- My take on it..
Mushroom Manchurian- My take on it..
1. Crush the ginger, garlic, coriander,Green chili, cumin coarsely. 2. Wash and cut the mushrooms each to 6 pieces. 3. Slice the shallots finely, add this and crushed mixture to the mushrooms along with APF and corn flour, salt and chili powder. 4. Mix well with little water. The batter should coat the mushrooms. 5. Drop each piece separately using a spoon into hot oil. Fry little at a time to golden brown, drain on paper towel and set aside. 1. Fry garlic till it loses it raw taste. 2. Add onion and cook till it is slightly soft.Then the peppers till it is cooked but has a crunch. 3. Add the sauces on high and mix well for a few seconds. Add a tbsp of water to this. 4. Then add the fried mushrooms and heat on high.Turn heat off. 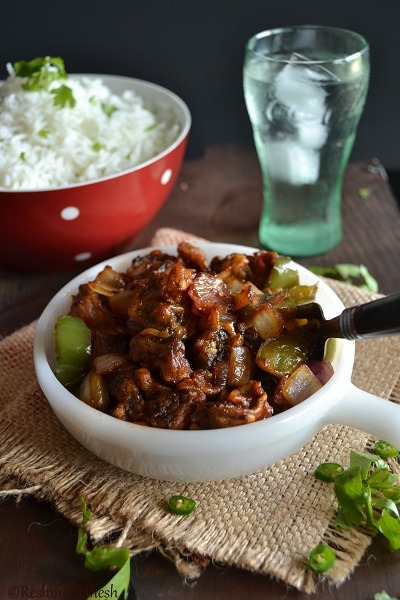 Garnish with coriander leaves(if using). 5. Serve warm as side to variety rice. 1. While making batter for the mushrooms add water little at a time. The batter should be coated evenly on mushroom.If more water is added batter(too thin) won't coat mushroom and if less water is added batter(too thick) will form lumps around mushroom. 2. Heat oil on medium heat and strat dropping battered mushrooms only when oil is hot and then fry slowly on medium low heat. 3. Add salt accordingly as sauces has salt in it. 4. Do not crowd while frying. Add little at a time. 5. My gravy was very less, just a little moisture added to fried ones. There was no liquid at all in this method. 6. If using button mushrooms cut each one to four pieces. Looks tempting and delicious.. 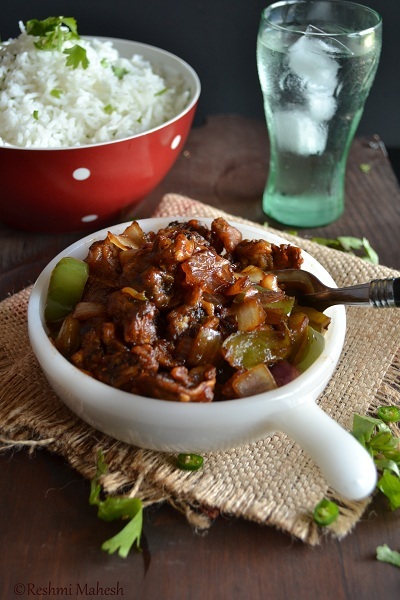 Recently tried this and loved it..
looks super delicious and saucy! What an awesome clicks! Loved teh dramatic feel on the clicks! Looks very inviting. Lovely Indo-chinese combo. 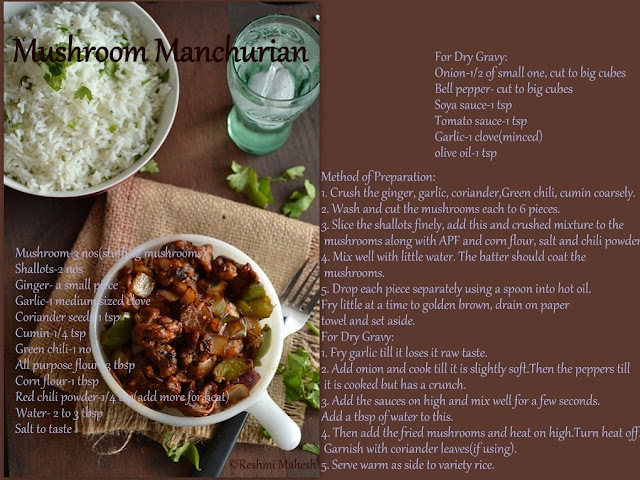 Manchurian looks spicy and saucy. Yum! Great picture composition. Superb presentation Reshmi...I am starving over the dish..Oops ! Mashroom manchurian looks spicy and yummy. 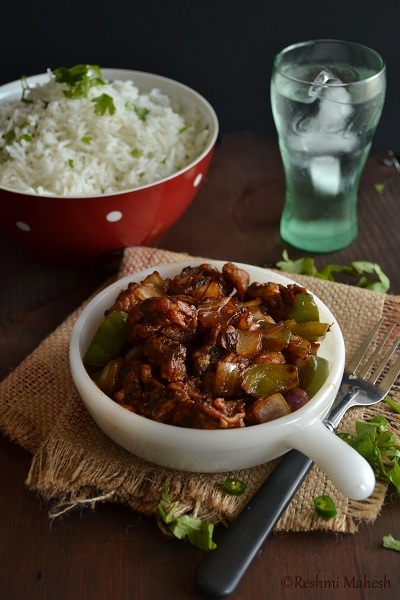 Looks super delicious, fantastic clicks! well done and nicely presented. Feeling like having it right now. What a complete meal! And looks so delicious. Lovely pictures. Sadly no mushrooms are prepared at home when it is just the spouse and me. Manchuria is mouth watering. Beautiful clicks & nice presentation. 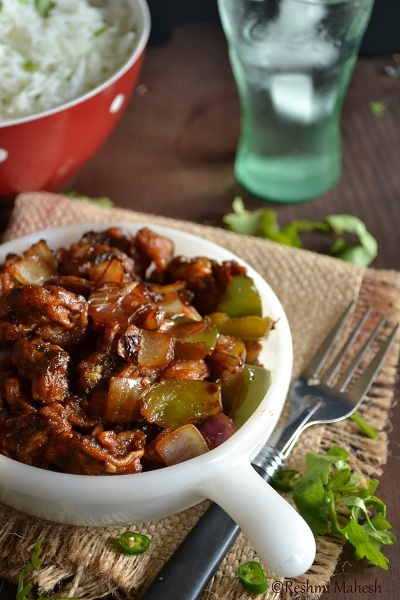 Cant take my eyes from ur bowl of fingerlicking mushroom manchurian. It's been so long since I had any mushroom dish. This looks so tempting. And Reshmi just loved the composition of the pics. Sounds and looks finger licking good. loved your pic.. your recipe sounds delicious..
M.manchurian looks very tempting...beautiful presentation n awesome clicks...love it!! 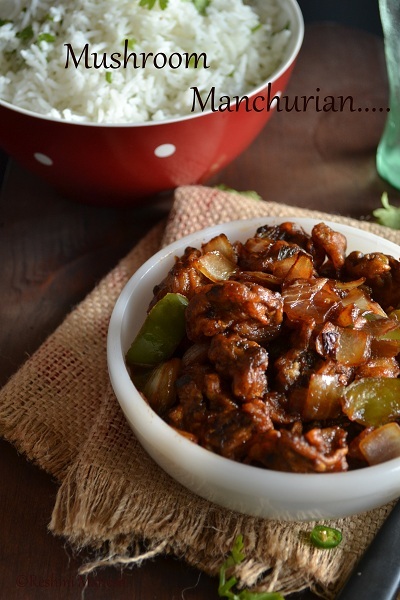 Delicious mushroom manchurian, I have to try this as mushroom is our family favorite. Very crisp and delicious. Thanks. Tempting mushrooms...Looks super good ! !